Architectural acoustics and room acoustics are frequently confused, yet the two are very different things. Room acoustics deals with the acoustical properties of an enclosed space when the sound source comes from within this enclosed space. Architectural acoustics deals with the transmission of sound between two rooms, or from the inside to the outside of a room (and vice-versa). 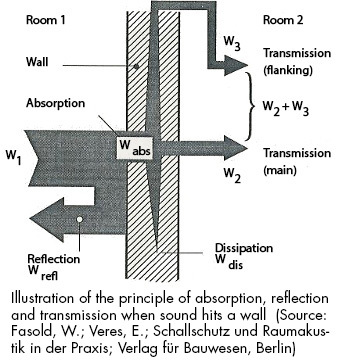 When sound hits a surface such as a wall (labelled W1 in this diagram, standing for sound power), a portion is reflected (Wrefl) and a portion is absorbed by the wall (Wabs). Combined, absorption (Wabs) and reflection (Wrefl) always add up to 100%. transmission to other building components by way of flanking (W3), structure-borne sound. Thus an open window is an excellent absorber (100%) yet it is not a sound insulator. If an enclosed space must exhibit both high sound absorption and high sound insulation (for example a musician’s practice room in a densely-built neighbourhood), a multiple-layered construction must be utilized.